The Florentine Andrea della Robbia inherited the workshop of his uncle, Luca della Robbia (died 1482), who had developed the technique of glazed ceramic reliefs for which his family became famous. His most famous works are the reliefs (1463-6) of babies in tondi on the loggia of the Ospedale degli Innocenti, Florence. He and his workshop also executed a number of reliefs for the Franciscan sanctuary at La Verna in ca. 1475-90. Andrea perfected the use of polychrome glazes rather than the simple blue-and-white schemes favoured by his uncle. ✴Luca the younger, who moved to France in 1529 and died there in ca. 1548. •the penitent St Jerome (to the right). •the Adoration of the Magi. This enamelled terracotta figure by Andrea della Robbia is now in a niche above the altar of the Cappella del Transito, Santa Maria degli Angeli. Its original location is unknown; it might have come from one of the oratories on the site that was demolished when the current church was built. The loggia of the Pinacoteca Comunale contains the following works that are by or attributed to Andrea della Robbia or his workshop. ✴This glazed terracotta relief of the Assumption of the Virgin was documented on the high altar in 1829. An inscription that was recorded on the frame there recorded that it was commissioned by three female heirs of Matteo dei Fucci: Casandra; Aurora and Niccola. his relief of the Adoration of the Shepherds was documented in the oratory attached to the church in 1728 and again 1868, when it was on the altar (the 1st on the left) that belonged to a community of Franciscan tertiaries. ✴This tondo relief of the Madonna and Child with angels was documented in the convent in 1728. This small relief, which was documented on the wall of a room of the nunnery of Santa Veronica, was moved to the gallery shortly after. The convent was not completed until 1643, so this cannot have been its original location. This glazed terracotta panel was original part of a larger relief that was in a tabernacle on Via delle Grazie, some 2 km from Montefalco. It was removed after a road accident in 1984 and restored before its transfer to the Pinacoteca. 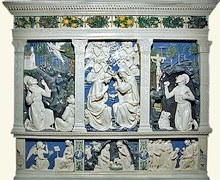 It is attributed to the workshop of Andrea della Robbia, and is clearly based on the main scene in the altar dossal (ca, 1490) by this artist in the Museo della Portiuncula, Assisi (above). These painted terracotta figures in the Museo della Castellina are from the Convento dell’ Annunziata, which belonged to the Observant Franciscans. They are attributed to Luca della Robbia the Younger.